Think back to the time when you were a kid and you and your mom would sit on the porch on an early summer evening, shelling peas for winter storage. Okay, this never really happen in my life because the peas never made as far as the kitchen, but this is something that I think of as a past time from generations before. 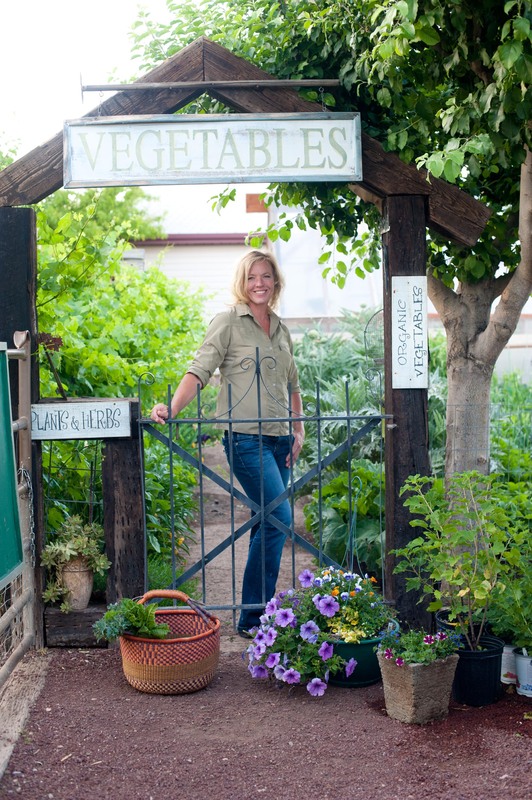 Simple life, simple pleasures bring me happiness just by the thought of it. I have, at times with my own children experienced something of the sort. Of course most of the time peas were consumed by my kids and their cousins sitting in the pea patch for hours making simple talk, enjoying each other and the sunshine during early summer months. When I could preserve peas I would never “can” them. If all you have ever had is canned peas and you despise them, I can understand. Truthfully I think canned peas don’t have any place on this planet! Fresh is alway best, but come winter months and you just want a couple handfuls for your soup or pot pie, freezing them is the next best option. 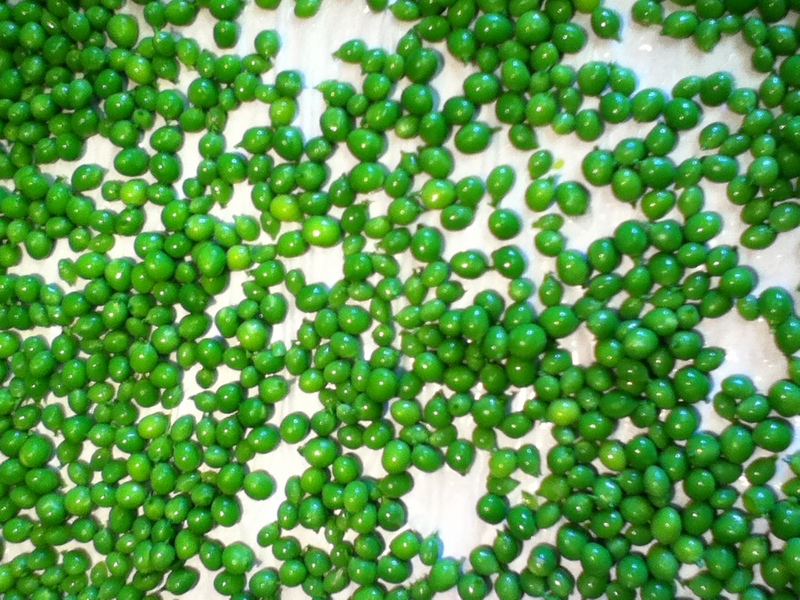 A couple of steps will help you have success in preserving your bountiful harvest of shelling peas. Pick peas early in the morning hours. This is when they are at their best and sweetest. Rinse if they are dirty. Shell simply by pressing your thumb into the seam and popping it open. Get some water boiling for blanching. Peas (and other veggies) contain enzymes and bacteria that break down over time destroying nutrients and change the color, flavor, and texture of food during frozen storage. 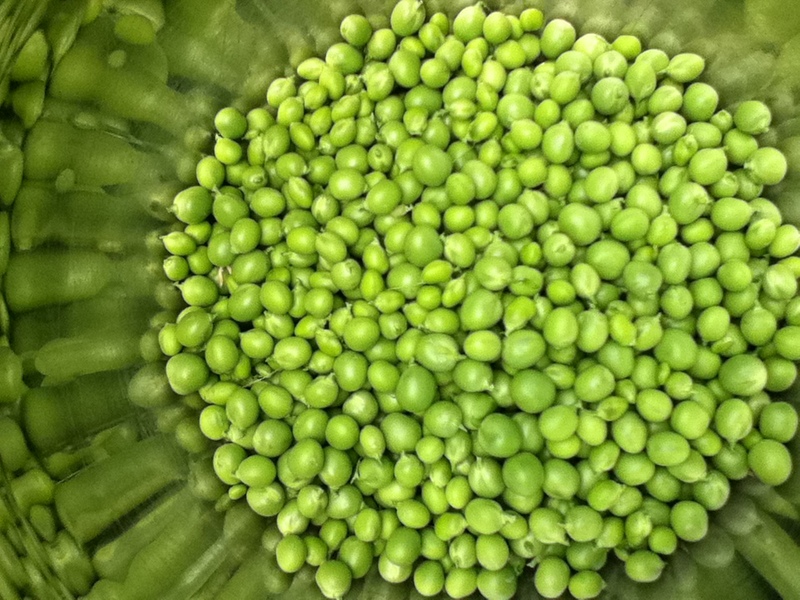 peas requires a brief heat treatment, called blanching, which is done in boiling water to destroy the enzymes before freezing. Get another bowl with ice water ready for cooling the peas off quickly. This stops the cooking process. 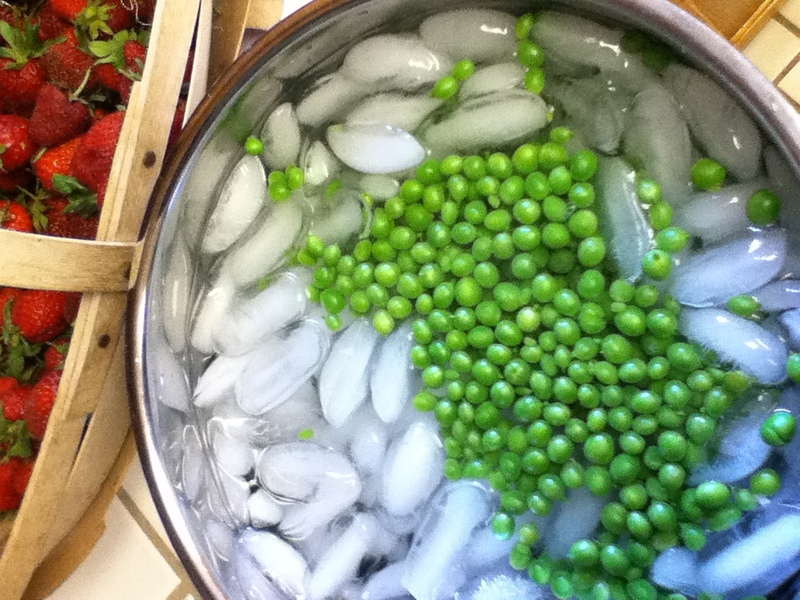 Pour peas into boiling water and blanch for no more than 90 seconds. Quickly drain (they smell so good) into a colander and then immediately into the ice bath. Let them stay in there for another 90 second. Drain well. I then put them on a baking sheet covered with wax paper or parchment. Spread them out so they don’t touch each other for the most part. Freeze for 15 to 30 min. This will make them easy to use so they aren’t in a big clump in a bag. I use this method of freezing for most things that come from the garden. I seal mine with a vacuum sealer. Date and once again freeze. Peas should be used within a year for freshest taste. Enjoy!